In December 1996, Nagamine Sensei came to Hawaii to receive acknowledgment of his Zen realization–Ken Zen Ichinyo (Karate and Zen in Oneness) from the Archbishop of Daihonzan Chozen-ji Tanouye Rotaishi, the 84th Dharma Successor of Rinzai Zen. The following is his speech given at a Testimonial Dinner held in his honor for his commitment to world peace through the Way of Karate. Karate is a martial art born and raised in an isolated island chain in the Pacific--Okinawa. Its marvelous trait has been widely recognized and has established world wide popularity. Today it is also widely acknowledged that Okinawa is the main breeding ground of karate-do. It is a well known fact that Okinawa’s karate culture has expanded all over the world. The School of Shorin Karate has established branch dojos in such various places as India, Germany, the United Kingdom and Australia. Other schools of Karate have also established their own branch dojos in similar locations. As such, in terms of numbers, karate has grown to the extent which we had never expected. Karate-do is a culture of hand to hand fighting sprung from a technique of fist fighting. Every country has its own art of hand to hand fighting, which is based on the human nature of self defense and survival of the species. The art of hand to hand fighting can be categorized into two types based on the traits and cultural standard of the people of each country. The first type is the one sublimated into sports. The second type is martial arts (budo) which includes the development of virtue. Karate-do is definitely a martial way, and its identity lies in do or principles. Any martial art without proper training of the mind turns into beastly behavior. Martial way training is a process to put forth effort to reach an eventual stage of "emptiness". What you attain through this training is called butoku (principles of warriors). I cannot help thinking that post war martial arts in Japan, possibly because of the influence of occupation policies, have turned into just martial technique and have lost their substance. Martial art students tend to be overly concerned with wins and losses and only seek reputation and awards. I am truly concerned with the fact that we have forgotten the way of mind - shin-zen-bi (truth, honesty and beauty) and lost the essence of the martial way. In recognizing the contemporary trend, Okinawa being considered the Mecca of karate-do, I would like to take advantage of this opportunity to discuss the origin of Okinawa karate in reference to the history of Okinawa, its legends as well as its traditional folk songs and proverbs. I truly believe that it is the duty of Okinawa karate people to adapt the principle of shin-gi-tai-ichinyo, (oneness of mind-technique-body), to the modern world, to pursue the traditional spirit of shin-zen-bi (truth, honesty and beauty), and to proudly transfer karate-do to future generations. I had a chance to ask Mr. Shuncho Hiki, an excellent historian from Okinawa, what is the Kokoro or spirit of Okinawa (Ryukyu). Mr. Hiki responded that it was guchoku, or being simple and pure. Mr. Hiki further explained that Okinawans are simple and pure but have deep inner strength. Because of this, they have difficulty in changing or adapting to circumstances. 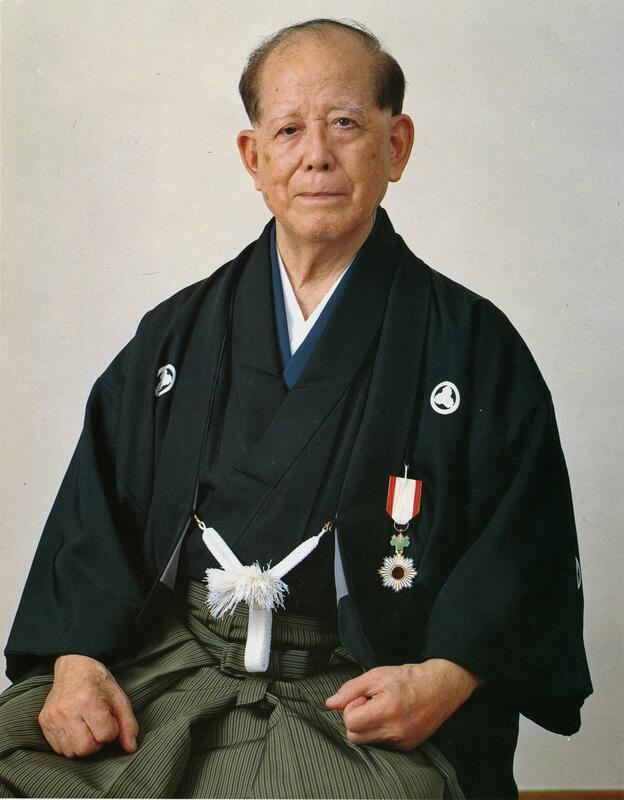 Mr. Hiki added "I have lived for over 90 years. I have not been good at adapting to circumstances, because of which I have incurred losses. However, I feel this is acceptable for me." In Okinawa, there is a saying, "your mind does not get disturbed by being beaten up, but by (you) beating up others." Simply speaking, it means that Okinawans prefer or accept the life style of being tricked and being taken advantage of, rather than hurting other people or asserting tricks on them. This saying expresses the typical Okinawan spirit of being simple and pure. The idea of being simple is not the thought of those controlling or governing other people; or those who cunningly adapt to circumstances to be controlled; or of subjects just giving into the fate of being governed. I believe the kokoro or spirit of Okinawa is one which shows an extreme non-resisting resistance action, beyond our imagination, when someone is cornered and/or when standing up against injustice. Shoshin-O was enthroned at the age of thirteen. He, a believer of Buddhism, had many temples built in various areas. He stripped the local lords of weapons such as swords and spears and had them put away in warehouses inside Shuri Castle. He then declared that weapons should be used only to defend the nation and forbade the people from using any weapons for personal struggles. Moreover, he relocated the local lords to Shuri Castle and had them appointed as representatives to govern their territory. This was the way Shoshin-O eliminated the possibilities of fighting and stripped the lords of any means of revolting. Chusan Kingdom, thanks to wisdom of Shoshin-O, could enjoy peaceful years until the invasion of Satsuma in 1609. It was a well known story that Napoleon could not help exclaiming "What? How could such peaceful islands exist in this world without any weapons!" when he was informed of Ryukyu Islands by a visiting British naval officer. It is ironic that the people of this peaceful island, not having any weapons, were put under a hellish misery by the ruling Satsuma. Ryukyu people, under the tyrannical governance of Satsuma, bearing the mind-set of being simple and pure, eventually expressed an extreme action of rejection, and created te (karate), and various other splendid cultural arts through the spirit of non-resisting resistance. History indicates that people of Ryukyu have developed, without holding arms, an honorable and peaceful kingdom of culture for over 300 years. There once existed a custom of attendants setting themselves on fire following the death of their master. This custom was stopped by Shoshin-O who forbade people from committing immolation approximately 500 years ago in 1477. One day, Shoshin-O, who had just lost his mother, was deep in sorrow. He noticed a boy crying out loud. After inquiring the reason from the boy, he was informed that the boy had been ordered to immolate himself. The boy said, "My mother does not know that I was ordered to immolate myself. How deeply saddened she will be when she finds out that I am dead!" Deeply disturbed by the severe fate of being immolated and sympathizing with the depressed feeling of the boy, Shoshin-O decided to ban immolation. This historical episode reveals how much the Ryukyu people respected life. "In a world full of conflict and strife, do not cry over the condition of the world, your life is the treasure "
This chant, composed by well known Ryukyu artist, Yamazato Nagayoshi, was written to describe the feeling of Shotai-O, the last king of the Shuri Clan, as he was evacuating his castle. Ryukyu people sublimed their respect of life, beginning with the ban on immolation, up to the stage of reverence. A Ryukyu proverb describing the mind of a Ryukyu warrior says, "even if you lose your glory, you should never give up your life." In other words, this proverb means that even if you lose your class or rank because of a new regime, you should not waste your life but try your best to survive the worst and then stand up again. The most precious treasure in this world is your life. It is because without your life, you cannot accomplish anything. The order banning immolation was issued by the Edo Bakuhu government in 1663. Let me discuss the viewpoint towards life from the Japanese bushido (Yamato Damashi-Spirit). Miyamoto Musashi is a well known sword master. He was a master who, through training of Japanese swordsmanship, comprehended and mastered philosophy, religion, values and arts. He left a book titled Gorin-No-Sho (Book of Five Rings) to his followers. A distillation of Musashi’s ideas was contained in Doku-Ko-Do, (Principles of Going Alone). Doku-Ko Do consisted of 21 articles, which he drafted to give to one of his senior disciples, Terao Magonojyo, on May 12, 1654. In Article 20, he wrote Mi o sutetemo myori wa sutezu - "Even though you may have to sacrifice yourself, you should not throw away your honor." In other words, he meant that if and when you disregard your honor, you are failing to follow do, principles, and gi, justice. In short, we should try to defend our honor even though we may need to sacrifice our life. In bushido, never be left behind. Always be ready to serve your master. Be dutiful to your parents. Be merciful at all time and assist other people. The Hagakure stated that if you pray these four oaths to Buddha and the Heavens every morning, then you will be able to receive their energy. The Japanese military, who led the Japanese people into World War II, claimed that it was a sacred war not only to the Japanese but to the world and emphasized the essence of Hagakure Bushido as "always be ready to die". They claimed that Hagakure was the same as the military way of thinking, taking the lives of soldiers very lightly and leading millions of people to perish. In the post war era of Japan, we are in the wave of Kokusai-ka or internationalization. The people of the world are more interested in knowing the traditional culture of Japan which has been the fundamental basis of the Japanese economic growth. However, many of the Japanese are not confident enough to explain our culture to outsiders. Taking advantage of strength in the Japanese economy, more than ten million Japanese are visiting abroad and having opportunities to meet many foreign people. I am very concerned that the foreigners will form a misunderstanding that the Japanese culture is economically based and consists of only people with money. In the historical perspective, a key factor of a nation being able to enjoy a healthy growth has been to maintain culture in one hand and martial arts in the other hand. That is, maintaining both of the above was critical in governing a nation. Martial arts and virtue must be unified as one. Martial arts without virtue is simply violence. Martial arts with virtue will purify society and culture shall flourish. Karate master, Matsumura Shokon, who was born in Shuri, Ryukyu in 1809, taught three consecutive kings seven virtues to serve as guidelines for karate which contributed to maintenance of Ryukyu as a peaceful kingdom. We, the people of Ryukyu, have learned the importance of human life through the banning of immolation. We also have learned human piety from the governance of religion and politics together. Moreover, we have created a spirit of mutual assistance. Through these lessons, island people, in peace without any weapons, have formulated an unprecedented and incomparable philosophy of karate ni sente nashi or "fists that does not strike first." Translator’s note: Literally translated karate ni sente nashi says "fists that does not strike first" or "not hitting first". A deeper extension of the translation is "the fists that give life". As written in Nagamine Sensei’s Okinawa no Karate-Do: "As a karate-ka, the kokoro (spirit/mind) of shin-gi-tai (mind-technique-body) is attained through spiritual forging in zazen. When oneness of the three, shin-gi-tai, is attained through spiritual forging, a true katsu jin ken (the fist of a person who gives life) emerges and for the first time one is able to win without a fight. Then one will truly understand karate ni sente nashi. Ryukyu has overcome the tyranny of Satsuma which had lasted over 300 years since its invasion by adopting the extremely strong philosophy of resistance without resistance, as was described by Hiki Shuncho. Karate, primarily a martial technique of self defense, has formulated a philosophy of karate ni sente nashi which still exists today. This philosophy could not be understood by the people based on the distorted interpretation of bushido spirit which took human life lightly. In a time when all the people but yourself are enemies, it was considered a matter of fact that you, holding swords on your side and carrying guns that were ready at all times, have to kill others to save your own life. The Pearl Harbor attack is one good example. I cannot help but admire the philosophy of karate ni sente nashi formulated by our predecessors whenever I see people in the world who are put in the midst of anguish because of weapons. I truly believe that exercising the philosophy of karate ni sente nashi is the basis of true peace in the world. I have learned it from the history of Ryukyu in which they showed their respect toward human life and created a peaceful and wealthy kingdom of Ryukyu. I would like to emphasize here that Ryukyu people’s resistance with respect to the issue of scaling down the size of United States armed forces in Okinawa is a good example of exercising the supreme right destined to Ryukyu people from the Heavens. The people of Okinawa would never be pushed back even if governing people try to force the issue. In the end, the resolve of the people will surface and press the governments of Japan and the United States into a corner by forcing a popular vote by the people. I have to say that both governments should be fully aware of this. People will not be fooled by a short term political solution. I truly hope that the people in the world would change their mind-set of aggression and first-strike to a philosophy of karate ni sente nashi. It is only through this philosophy that world peace will be achieved.